Marc Marquez mingled with the Italian public before heading to Misano, where the thirteenth round of the season will be held on Sunday. 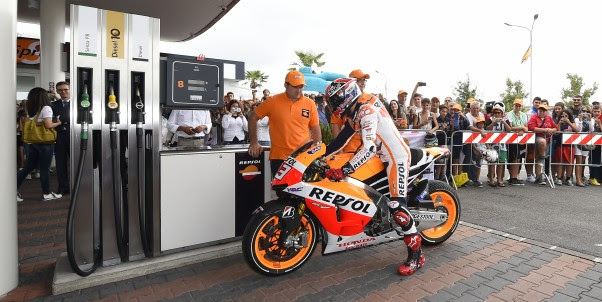 The reigning MotoGP World Champion opened the Repsol service station in the city of Corpolo (Italy), near Rimini. The Repsol Honda rider arrived at the service station on his RC213V, to fill up the tank in front of hundreds of fans and both local and regional authorities. Repsol is in a phase of expansion in Italy, where it currently has more than 250 service stations and a presence in the business of direct sales and lubricants. ← Ban tahu, nyamankah digeber ditengah kota? kui rcv diombeni opo yo?? ?